How do you feel about tattoos? I admire the bravery of celebs that have tattoos. As I’m a bit indecisive, I could never make a decision that permanently affects my appearance. Fashions change and I can’t think of anything worse than getting a tattoo and regretting it a few years later. Laser removal is both painful and expensive, so not really an option for most of us. 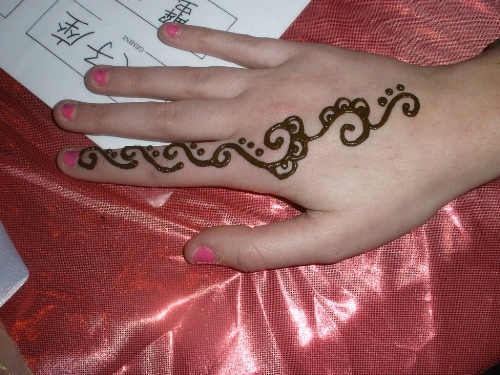 However, there is a middle ground – henna tattoos. If it’s good enough for Beyonce, it’s good enough for me! 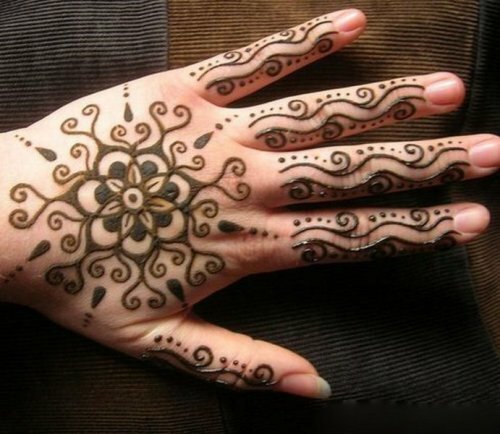 If you’re just starting out with henna then you probably don’t want to risk going freehand. Henna paste is best fresh so you can either buy the powder or look for a store that sells fresh henna online and ships regularly (I recommend Hennashop.co.uk). Scrub the skin that will get the tattoo to remove any oil from the skin. Pat it dry. Practise using the tube on a piece of paper so you know how quickly it comes out and how much pressure to apply. Then it’s time to use the stencil above. 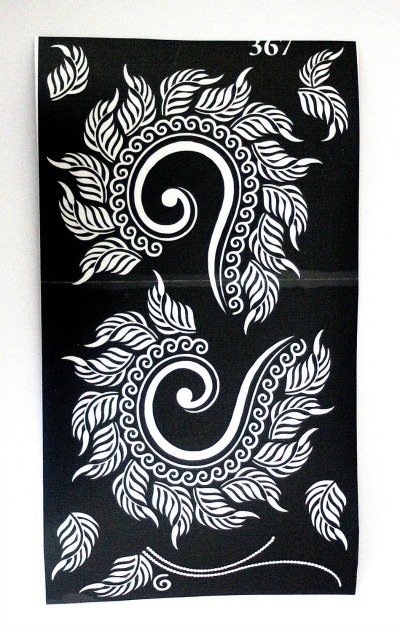 All you have to do is apply a thin layer all over and then remove the stencil and you have beautiful pattern. 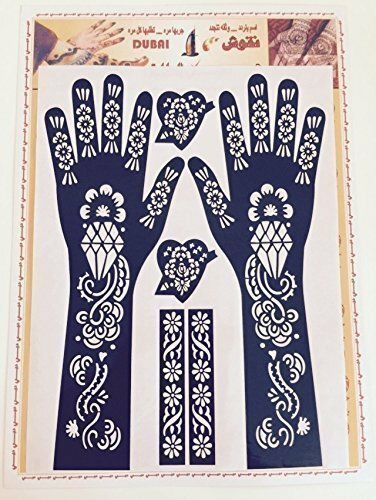 There are lots of stencils, just like this one, on Amazon. I like this shape as it looks more intricate than a traditional circle design but using the stencil makes it easy. This is great if you’re wearing a feminine dress, but I’d also have it when I’m wearing a leather jacket and show off that I’m feisty but I’m also womanly. 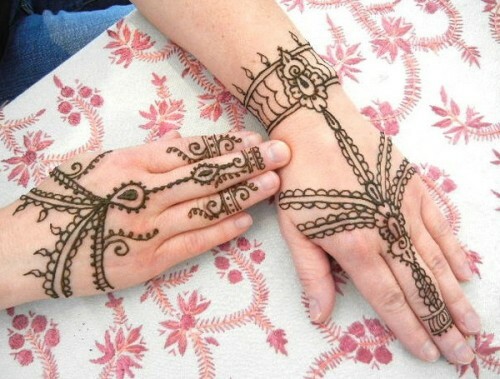 TOP TIP: As soon as the henna is applied to the skin, it will begin to dry. The paste will crack as it dries, and when it starts to crack, keep it moist for as long as possible. Squeeze a wedge of lemon and mix it with a bit of sugar. When the henna has dried enough to be stable, re-moisten it by dabbing it with a cotton ball soaked in the lemon/sugar mixture. This has a twofold effect: the acid in the lemon helps the skin continue to take in the stain, and the sugar creates a sticky coating that helps hold the henna on the skin. If you can, leave the paste on for 8-10 hours. Start off small and build your confidence! This is easy to apply as you start with a flower in the centre of your hand then add just two more. The lace effect is just made by drawing lines – simple. If you want something super low risk then a question mark design is a lot easier to draw free-hand than a flower. Do a question mark shape and then fill in with dots. You can elaborate this by adding a design to other fingers. 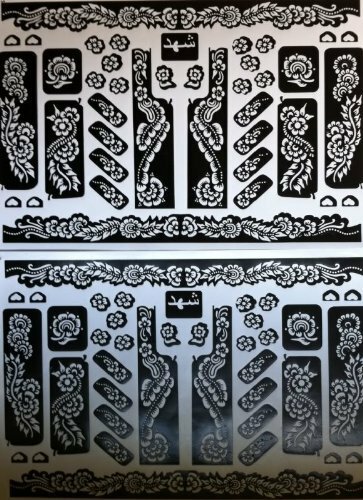 Create your own designs by mixing and matching several of these sticker stencils that I found on Amazon. It allows you to be creative, but at the same time be safe because all you’re doing is painting over a stencil. Put the small stickers on your fingers and then use the long stencils to flow elegntly down your wrists. This looks super complicated but it’s not as hard as it looks as there are no flowers to master. It’s just plain lines and lots of semi circles on the plain lines. Build the lines gradually and go step by step doing each line at a time in a systematic way. It may look advanced, but really how hard is it to do a line and a semi circle then keep going? Do the palm portion portion first. Create a big flowe building up the petals slowly. 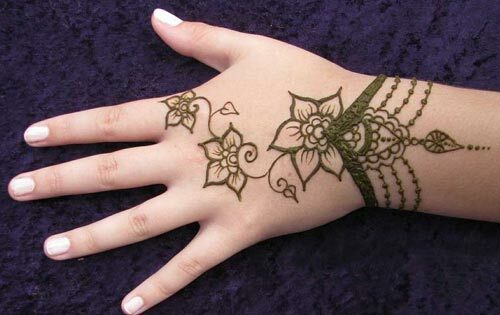 Then fingers are filled up with mehandi design which can compliment the palm designs, such as swirls and question marks. This is one huge flower and a lot of swirls. If you take your time, and maybe practise on a piece of paper first you can do it. What do you think? Are you ready to give henna a try?